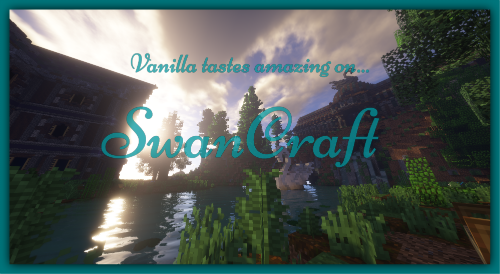 SwanCraft aims to give you something different: a place to call home. Our close-knit community is ready to welcome you into our family! We aim to keep gameplay itself as vanilla as possible, while providing access to some commands that make Minecraft life a little less mundane. For example, we have /tpa, /sethome, and /spawn. There are numerous rewards available in the crate. They often contain OP custom items, Collection Series, hard to obtain materials and more! We want everyone to enjoy their time on SwanCraft. We try to promote a friendly environment free from toxic energies. Players are encouraged to voice any suggestions or concerns they may have for the community. More than one event will be held monthly. Ideally, we like to hold events at different times of day to try to cover all of the time zones. Although sometimes that isn't possible, we certainly do try our best! +Check out our one of a kind Player Market located on floating islands!! We use in-game items as currency. No economy plugins here!